I have three words that describe Sam D. Kim, senior pastor of 180 Church. The first word is Anointed. I chose this word because it appears to me (and to others it would seem) that, from a very young age, Sam has been anointed of God. It all started when Sam at the tender age of ten became a follower of Jesus. The story of his conversion is filled with much humor and involves a picture of Jesus whose eyes followed him as he walked by it. I’ll let Sam share with you that story. All that interests us here is that Sam became a devoted follower of Christ at age ten. When Sam entered tenth grade, he began to sense God’s call to ministry which led him to start sharing his faith among his school friends. That, in turn, led him to start a weekly student-led Bible study which eventually brought some 40 kids to Christ. Thanks to the fruit he harvested in high school, churches began inviting him to give his testimony. Later, those requests turned into speaking engagements which, eventually, led him into full-time ministry. After immigrating to the states, he attended Nyack College and Alliance Theological Seminary (ATS). While, in college, he was mentored by Ron Walborn, Dean of ATS. How many guys do you know was mentored by the Dean of a seminary? In seminary, he was mentored by Martin Sanders, Director of DMin in Christian Leadership in the Global Context. Again he was blessed. His relationship with Sanders enabled him to become a participant of the Lausanne Movement and attend Cape Town 2011. Undoubtedly, Sam is anointed of God. I expect that God will continue to bless him in extraordinary ways. I wait with eager anticipation to see how God will bless and use Sam in the days ahead. The second word I would use to describe Sam is Basketball-fanatic. (Yes, I know…it’s two words). I didn’t know this about Sam when I first met him, but he is a total basketball nut who eats, sleeps and breathes basketball. He doesn’t just love watching the game, but he also loves playing it, setting time aside weekly in his busy schedule to shoot a game or two. 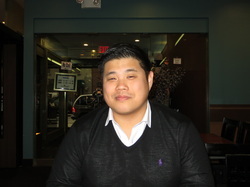 He also enjoys immensely going to games and rooting for his team…especially when Jeremy Lin was playing for the Knicks! He nearly swooned as he recounted for me his memories of those games with Jeremy at the helm of the Knicks…the place was as he put it electric, the Garden rocking…not unlike the games the Knicks played against Michael Jordan. After hearing all this, you might imagine that Sam is a “bleeding orange and blue” Knicks fan, but you would be wrong. He became a Nets fan after the Knicks went back on its word and traded Lin. From Sam’s perspective, the Lin betrayal was unforgiveable and, I suspect, that many reading this article may feel the same. Linsanity was insanity! The third word I would use to describe Sam is Comforting. I found it difficult to find the right word to express my third “one-word” description of Sam. That’s because the word doesn’t describe him as much as it describes how he makes me feel when I am with him. How does he make me feel? He makes me feel comfortable. I have only met Sam twice. Each time I found myself talking to him as if he were an old friend instead of someone I barely know. In fact, the first time I met him, at our 2012 annual Christmas Appreciation Lunch, I felt so comfortable with him that I instinctively did something to him that I would NEVER dare do to any pastor I meet for the time time. I tapped him on the head with a book when he rudely continued talking while I tried to get everyone’s attention. I might do that to a good friend whom I have known for a long time as reminder to shush…but never, ever, until now, would I tap on the head a pastor I just met! But that was the kind of effect Sam had on me - feeling comfortable - the two times I met with him (the second time was when I interviewed him for this article). I wonder, is that how YOU feel when you are with him? I suspect that I may not be the only one who feels that way when speaking with him. And I would venture to guess that this “charisma factor” God has blessed him with will serve him well in ministry as he fulfills the mission and work God has given him here in New York City.